What is the Relationship Between Food Allergies and Autism? Autism is a disorder that affects brain development in children. This condition causes problems with social interaction and communication skills, and limitations in behavior patterns. Autism is likely genetic, although there also seem to be environmental factors that influence the disease. Do Food Allergies Cause or Worsen Autism? In recent years, various studies—mostly in the alternative medicine literature—have suggested that food allergies play a role in causing or worsening autism. Specifically, gluten (a wheat protein) and casein (a milk protein) have been blamed for worsening symptoms in children with autism. These food proteins are felt to be broken down into smaller proteins (peptides) that function like narcotics in children with autism, thereby worsening the behavioral changes of autism. Many other foods are blamed for worsening autism as well, including eggs, tomatoes, eggplant, avocado, red peppers, soy, and corn. However, authors of alternative medicine literature on the subject of autism and food allergies admit that allergy tests to these foods, as well as to wheat and milk, are usually negative, and most of these children do not seem to experience typical symptoms of food allergies. Therefore, they recommend testing for specific antibodies (IgG) against these foods. This practice, however, is in conflict with a set of guidelines known as the Practice Parameters for Allergy Diagnostic Testing. These guidelines state that IgG antibodies have no role in the diagnosis of food allergies. In order to test the impact of these foods, studies have looked at the effects of food restriction (mostly gluten-free and casein-free diets) on children with autism. Most of these studies are of very poor quality and not up to modern-day scientific standards. One 2004 Cochrane analysis on this subject found only one small, well-designed study that showed some improvement in autistic traits in the children receiving a gluten-free/casein-free diet. Another Cochrane analysis cites two studies showing a small improvement in three aspects of autism: overall autism traits, social isolation, and overall ability to communicate and interact, but otherwise noted no significant difference between the treatment group and the control group. Studies of larger numbers of children are needed to confirm the results of these small studies. How Could Foods Worsen Autism? It’s not completely clear that foods do worsen autism, although there are many theories about how this could occur. It's been suggested that autism could result from a loss of regulation of the immune system, causing an increase in inflammatory-causing chemical signals from white blood cells. It is felt that these chemicals (cytokines) may be responsible for the neurological abnormalities seen in children with autism. Recent studies suggest that children with autism may respond to certain foods, particularly gluten- and casein-containing foods, by producing more of these inflammatory cytokines. Blood cells from autistic children were cultured with various foods in a lab, and various inflammatory cytokines were measured. The cytokines from the autistic children were much higher than those from normal (non-autistic) children after being exposed to gluten or casein. This increase may help predict when an autistic child would benefit from dietary avoidance of these proteins. Are Women With Allergies at Risk for Having Children With Autism? It has also been suggested that the immune system changes a pregnant woman experiences could place her child at risk for autism. Many reports of women with various autoimmune diseases, such as type 1 diabetes and rheumatoid arthritis are at increased risk for having children with autism. A recent study assessed the relationship between autoimmune diseases and autism. It found that only psoriasis predisposes a woman to having a child with autism. However, the study also showed that having allergic rhinitis and/or asthma, particularly when diagnosed during pregnancy, places a woman at increased risk of having a child with autism. Again, the reason for this is not completely clear; however, most theories involve changes to the immune system during pregnancy and the production of these inflammatory chemicals. These cytokines may somehow contribute to symptoms of autism in genetically predisposed children. In recent years we have been learning that the bacteria we harbor in our intestines may affect everything from the diseases we develop to our moods. This science is still in its infancy, and it is uncertain what, if any, role gut bacteria play in autism, but researchers have found differences in the gut microbiome among children with autism spectrum disorders. 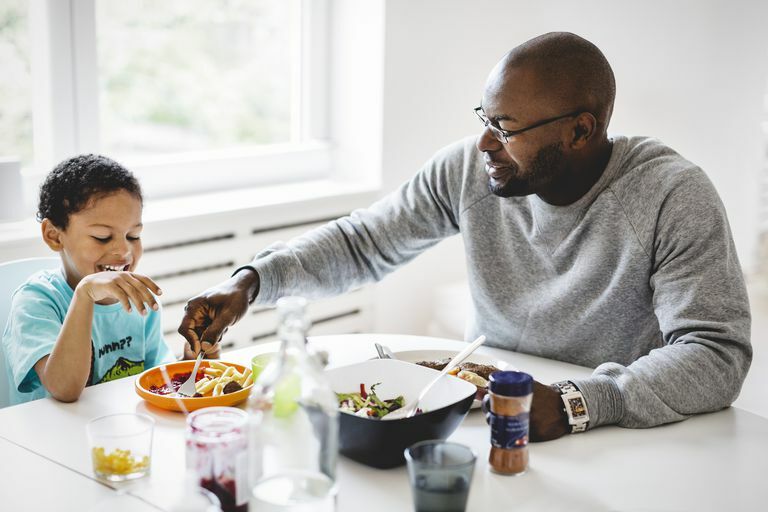 Fortunately, many studies are in progress and we will likely have more information available in the near future as to whether dietary changes might lead to a change in the gut microbiome that could be advantageous to children with autism. Should My Autistic Child Avoid Eating Gluten and Casein? At the present time, there does not appear to be enough information to support following a gluten-free/casein-free diet for children with autism. Furthermore, limiting a child’s dietary intake, especially by avoiding nutritionally important foods such as milk and wheat, may be dangerous. Many parents with children with autism disorder are willing to try just about anything to help their child. It's important to talk to your doctor if you wish to work with your child's diet. In general, following these diets is a major endeavor that can affect the whole family. If you are serious about making these changes, learn how to follow a casein or gluten-free diet. There are many hidden sources of gluten, and eliminating this nutrient can take some major detective work. Many people find it helpful to keep a journal when eliminating foods in order to have an objective measure of any changes. You may wish to make a list of your child's autism traits and use a number between 1 and 10 to rank these behaviors both before and after a change in diet. Changing your child's diet, and potentially the production of inflammatory cytokines usually takes time. You might not expect to see any changes overnight or even in the first few weeks of a change. Talking about the uncertain role of food allergies in autism disorder doesn't mean that diet isn't incredibly important for children with autism. The old adage that "we are what we eat" carries a lot of meaning. The intake of processed foods is simply not healthy for our children, whether they have autism spectrum disorders or not. While allopathic medicine is often at odds with alternative medicine with regard to the influence of particular foods on autism spectrum disorders, both sides of the spectrum would quickly agree that a diet rich in fruits and vegetables which minimizes processed foods should be a very high priority in the management of autism. We will hopefully be learning more, as well, about the possible role of the gut microbiome, and how this may be influenced by diet, in children with autism. Han, Y. Cheung, W., Wong, C. et al. Distinct Cytokine and Chemokine Profiles in Autism Spectrum Disorders. Frontiers in Immunology. 2017. 8:11. Jvonouchi, H. Food Allergy and Autism Spectrum Disorders: Is There a Link?. Current Allergy and Asthma Reports. 2009. 9(3):194-201. Li, Q., and J. Zhou. The Microbiota-Gut-Brain Axis and Its Potential Therapeutic Role in Autism Spectrum Disorder. Neuroscience. 2016. 324:131-9. Strati, F., Cavalieri, D., Albanese, D. et al. New Evidences on the Altered Gut Microbiota in Autism Spectrum Disorders. Microbiome. 2017. 5(1):24.